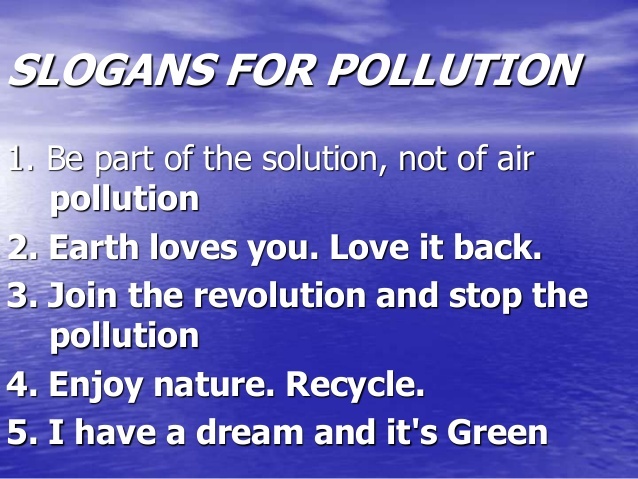 POLLUTION SLOGANS:- We have provided below some inspirational and encouraging slogans on pollution to use during green processions, protest against an act of polluting or other related events. 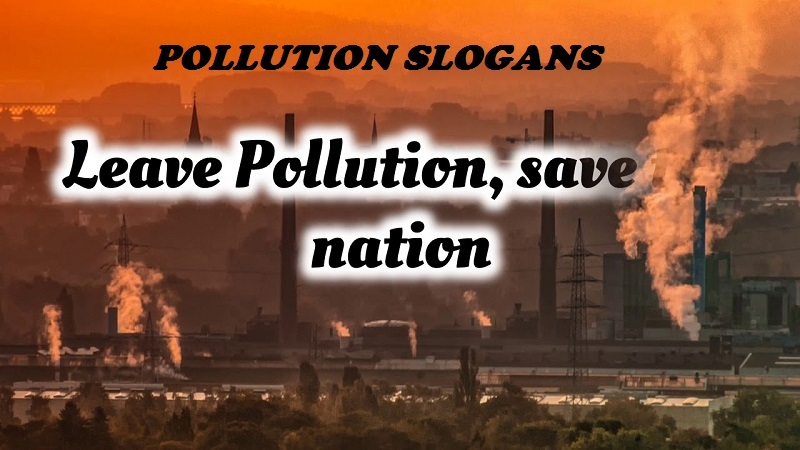 Pollution slogans are also used by some good educational institutions to display in the buildings to raise environmental awareness among students whereas non-governmental organizations use them to publicize their green message against pollution all over the country. Be green, be pollution free. Go green to eliminate pollution. Reduce needs, recycle wastes, and reuse things to reduce pollution. Say loudly, ‘No’ to pollution. Pollution is pollution, it is harmful in anyway, pledge to remove it. Feel the harms of pollution and act positively to reduce it. 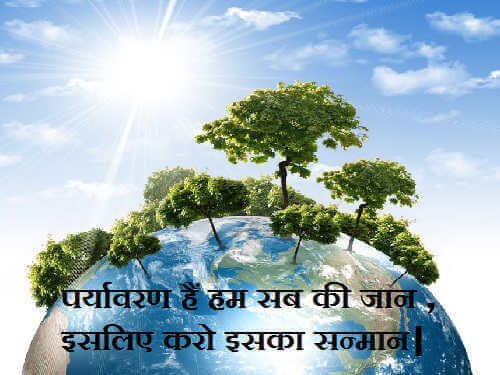 Change your life style in the favour to reduce pollution. The only solution to pollution is 3R (Reduce, Reuse, Recycle). Act seriously over all the solutions to pollution. 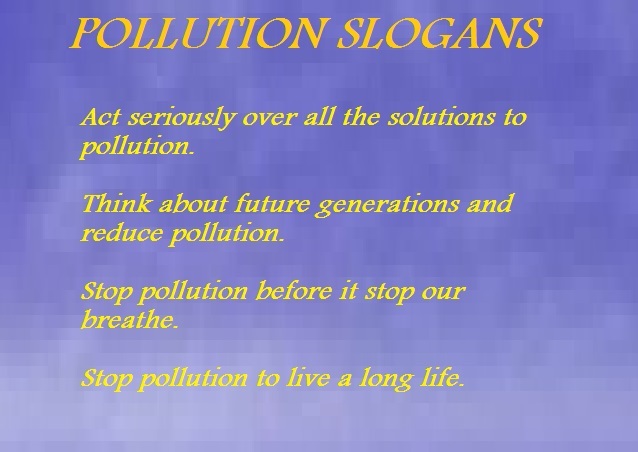 Think about future generations and reduce pollution. Pollution are slow poison, act slowly but lethally. Stop pollution before it stop our breathe. Try to eliminate pollution till the last breathe. Stop pollution to save the next generation. Stop pollution to live a long life. Stop pollution to eat healthy and breathe fresh. Pollution is a demon, don’t forgive it. Pollution is arised of man’s bad actions, so it can be eliminated too. Fight pollution to bring right changes in the environment. Fight pollution to get at least slight relief. Follow effective solutions to fight pollution. Control your needs to control the pollution. Love the nature but hate the pollution. Welcome the greenery but say bye to pollution. Pollution is killing the nature’s purity, kill the pollution. Don’t pollute the environment; it will finish life on earth a day. Stop polluting and start living healthy. Polluters are criminals, must punish them. Control your bad activities to control pollution. Follow environmental rules and regulations to reduce pollution. Kids must know about causes of pollution. Teach your kids about causes of pollution and prevention methods. Polluters are hidden killers, punish them. Don’t be a polluter, be a hero and act to reduce pollution. Polluters are rivals of nature’s beauty, punish them. Turn a polluter into non-polluter and be a real hero. Point out polluters and teach them. Polluters are shame on this planet. Polluters are making us sick, search and punish them. Pollution is destroying us physically, mentally and socially. Pollution are injurious to health, let it destroy. Noise pollution causes deafness among people, unite together to destroy it. Recycle wastes and reduce pollution. Use dustbin to throw garbage but be sure to recycle it. Don’t throw garbage here and there otherwise it will eat you. Don’t create much garbage otherwise it will make your life garbage. Earth is our only planet to live, don’t let polluters to pollute it. Reduce air pollution and let your lungs breathe fresh air. Love the nature; it will bless you with long life. Eradicate pollution! Load your lungs with fresh oxygen but not with toxic gases. If you pollute the air, where you will breathe in clean air. Eradicate air pollution and improve the IQ level of your kids. Use cycle or share vehicle to reduce air pollution. Water bodies are not dustbin, don’t load them with garbage. Keep water bodies clean to get fresh water in future. Don’t fight to each other, just fight with pollution. Clean air is always fair, don’t let it be polluted. Care for fresh air and don’t share it with toxic gases. Don’t do sin and get win over pollution. Don’t be mean, keep environment clean. Be wise but don’t rise pollution. Salute the earth but don’t pollute. Don’t be mean, keep earth clean. Kill the pollution otherwise it will kill you. Saying No to pollution should be your new resolution. Don’t be fool and let atmosphere cool. Be green to keep environment pollution free. Join the green revolution to reduce the pollution. Search for solution but not for pollution. To be healthy, wealthy and wise; raise your voice against pollution. Be aware to reduce pollution and make it rare. Don’t use plastic; it is making your life drastic. Always remember to recycle and use cycle. Teach polluter to nurture the nature. Make this earth a pollution free planet. Plant more trees to fight pollution.